In hosting parties in your own homes or offices, the most likely tendency for you is to look for that particular something that can creatively serve as an eye catching décor. To create a centerpiece or central point is an effective way in offering a decorative feature to draw your guests’ attention while stimulating conversation. 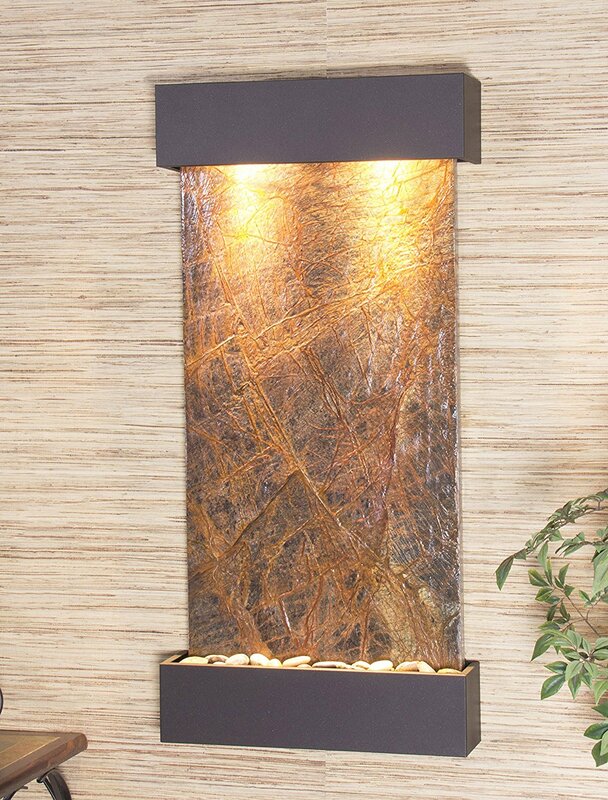 Indoor slate wall fountains are highly recommended as they display a unique beauty that is definitely a treat to anyone’s eye. In these next few paragraphs, you will know what benefits you can gain from using fountain lights and other materials so your fountain can become the life of the party. The following tips and tricks are simple and do not require you to have an overflowing budget. Moreover, they can help you in creating an elegant decoration without having to harm or damage your fountain. Before finding out the countless possibilities on how to dress up your indoor fountains, it is always important to remember that several things are not allowed to be done with this water feature. First, you are not allowed to place any glitter, bubbles, oils or any other liquids into your fountain water. This is not recommended as your fountain’s pump is sensitive and glitters will clog it up quickly and keep it from running and functioning properly. Oils can harm both your fountain and its pump especially when used on indoor slate wall fountains which are made out of polished stones and natural minerals. When using different types of liquids, bubbles can quickly overflow and will turn your fountain into huge mess. You do want to avoid these wrong actions as they can void your fountain’s warranty. On the other hand, you can use fountain foggers as they are an excellent way in creating a mysterious atmosphere within your party. These fogging machines will trigger your fountain to produce a mist that can truly provide a unique and one-of-a-kind visual effect. What’s great is that you don’t have to deal with dry ice and other stuff in creating the fog and mists. You can just place the fogger into your fountain and turn it on. The unique effect and appearance that it will create will definitely be something for your guests to talk about especially with special indoor slate wall fountains that are breathtaking and soothing at the same time. Most of these machines can be added to fountain lights to give off a distinctive glow that can mystify and entertain everyone. To use fountain foggers and lights is a wonderful way of creating fun at any party. You can choose over a large number of different lighting options such as pond lights, color changing lights and even floating candles. It is also easy for you to look for colored lights so it can match any décor or theme, allowing your indoor fountain to stand out in any occasion. Your party doesn’t have to be so bland and traditional, and you won’t even have to spend a lot on decorations that you will not use again. By putting a few extras on your fountain, you can create a splendid decoration that can be used even for the long years to come.